Reuters drops some nuggets of gold in this article but for the sake of brevity, and my 9am deadline, I'm going to paste the relevant pieces. This is in regards to last week's post on CGCMT 2013-375P. While this type of rating agency sniping has been going on over the past two years...it has never been timed in this way, according to industry participants. "The underwriters clearly emptied the old bag of tricks on this one, as far as crisis-era underwriting goes, and the agencies [fell for] them," said the head of CMBS investing at one of the biggest asset managers in the country. Those tricks included re-measuring the building, lowering management fees in order to minimize projected expenses, and creating an 'optimizing' structure that pushes as much away from the mezzanine debt into the securitization at the Triple B minus level. ...the Triple A portion of the US$572.9m transaction was increased at pricing on Thursday from US$75m to US$209m. Spreads on the most subordinate pieces widened considerably, however. The deal was originally US$439.75m. 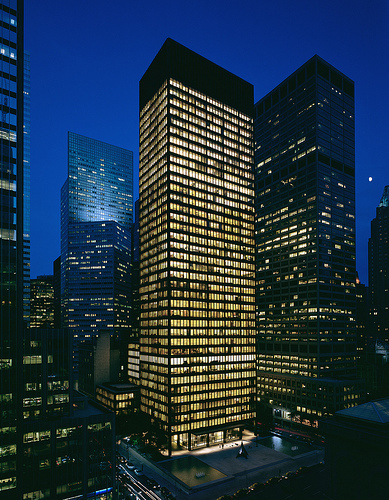 The underwriters securitized the entirety of the so-called subordinate, or junior, portion of a US$782.75m commercial mortgage on the Seagram building. However, they only securitized part of the senior portion, known as the A loan, leaving the flexibility to increase the Triple A piece in the bond transaction. he remaining unsecuritized portion of the A loan will be put into an upcoming multi-borrower CMBS conduit. ...they generally thought that the issuer's initial projected numbers regarding net operating income, occupancy, expenses, structure, and other metrics on the top-notch building were way too aggressive. Therefore, each agency assumed a steep haircut on the building's net cashflow and valuation in order to arrive at its Triple A enhancement levels. Moody's undercut by 10.7% the underwritten cashflow. The underwriter, Goldman Sachs, used pro forma assumptions to calculate so-called Revenue Per Available Room (RevPAR), presenting a projected cashflow of US$174.4m. ..last November Fitch gave Triple A grades to a deal linked to an office building, 1290 Ave of the Americas, with pro forma projections. the underwriter's cashflow was US$94.4m, while Fitch assumed US$89.9m. then I'll start to get worried. Fitch does not seem to agree with Kroll's rating of a $782.75M, interest-only mortgage that was stuffed into the recent CGCMT 2013-375P deal. For the uninitiated, Fitch seems to believe that the underwriting assumptions used to finance RFR Realty's acquisition of the Seagram Building is a bit aspirational, to say the least. --2012: $54,078,388 (average occupancy of 94.4%). This compares to the issuer's NOI of approximately $74 million and average occupancy assumption of 96.7%." --$2.2 million from a recent re-measurement of the building increasing the total sf to 858,000 sf." I'm in the middle on this one. On one hand I'd like to believe that Fitch has a point and is acting prudently but on the other hand, it seems as if they're still trying to make amends for missing some of the market tops that occurred in 2006 and 2007. Not sure if Fitch is being proactive or reactive. Fitch provided preliminary feedback of $510 million at investment grade and was not asked to rate the transaction. Right-click and select "View Image"
So yes, let's see how this one plays out. East Ridge Mall ($44.5mm - WBCMT 2005-C22) was liquidated last month after GGP tossed the keys back to the servicer. The sales price came in at $7mm (was appraised at $13.7mm in August! ), which Barclays expects to result in 100% loss in principal, partial payback of outstanding ASERs, TI&LCs and transaction costs.